Two frogs were on their merry way to the big frog hoe-down. While they were traveling along a rutted road, they slipped and fell into one of those deep ruts. After exerting all of his strength, the bigger of the two frogs was able to jump out of the rut. But, try as he might, the smaller frog just wasn't strong enough to escape. Finally, the little frog told his friend to go to the hoe-down without him... and he did. However, hours later, his froggy friend was amazed to see a very tired little frog walk into the frog dance hall. "How did you manage to get out of that rut? ", he asked. The little frog simply replied: "A truck came along. I had to!" 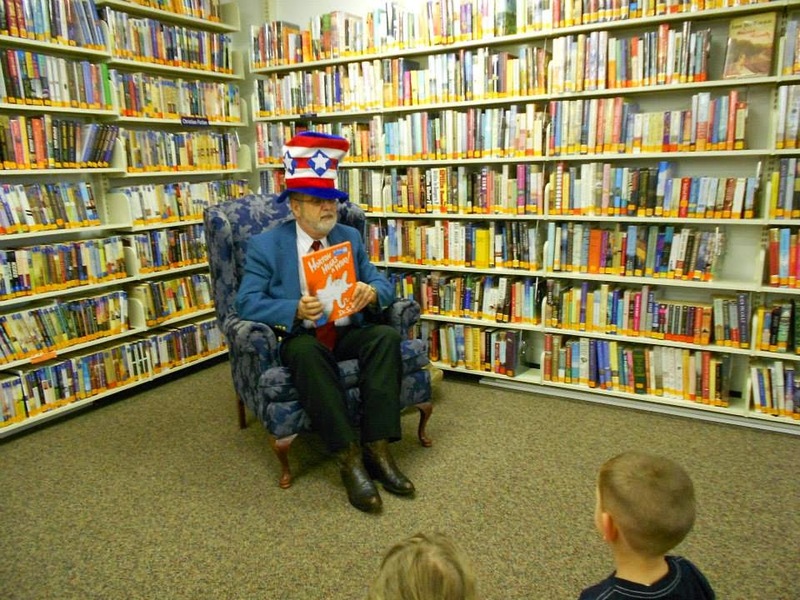 Delegate Larry D. Kump reads "Horton hears a Who" to the children at the North Berkeley Branch Library (in Spring Mills, West Virginia) on the library's 50th birthday. 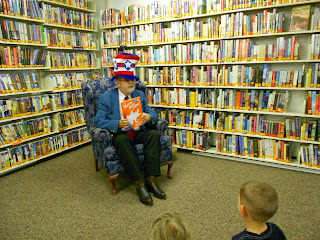 He also wore a "special" hat in honor of Dr. Seuss (see "The Cat in the Hat") as well as the 150th birthday of the State of West Virginia. The "Horton Hears a Who" book is one of the all time favorites of Delegate Kump, because of the lesson it teaches about the worth of every individual. His favorite quote from the book is, "Don't give up! I believe in you all! A person's a person, no matter how small!...If you make yourselves heard! So come on, now, and TRY! ...We've got to make noises in greater amounts! So, open your mouth, ...! For every voice counts!" Please advise me if the West Virginia Ethics Commission has jurisdiction over the ongoing findings of the West Virginia Legislative Audit regarding the issue of the shady communications expenditures and process, wherein the West Virginia Senate President and the Speaker of the West Virginia House of Delegates now also have authorized a report on these findings to the federal prosecutor. If so, I herewith request that the West Virginia Ethics Commission also investigate and take appropriate action on any ethics violations. I want to add my voice to what I expect to become a crescendo of support for Larry Kump's candidacy as Delegate. 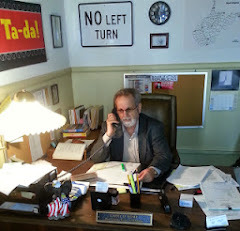 I've know Larry for the better part of the last two years through the monthly meetings of the Berkeley County Republican Party, his emails about his stance on issues and comments on my earlier letters to various newspapers and his web page. (Larry has no peer when it comes to timely communication!). Without fail, I've know Larry to focus on issues most meaningful to me as a retired and disabled Senior, father and grandfather! Larry always conducts himself with integrity and humility. I know some might ask, "Sam, why are you commenting, you're not in Berkeley County anymore." The answer is simple. I do this out of concern for the many friends and family I've left behind. I have two adult children and three grandchildren still living in the Eastern Panhandle. I can think of no greater champion for friends and family than Larry Kump! I believe so strongly in Larry's candidacy that I made a contribution to his current campaign as my final act while departing Berkeley County. Yes, I really do think that much of Larry Kump's candidacy. As should you! Delegate Larry D. Kump is probably one of the most, if not most, trustworthy Delegates I have ever come across. He stands up for his constituents, stands up for our personal liberties and freedoms, stands up for our 2nd Amendment rights, and votes with a clear conscience. He is a firm believer in transparent governmen,t and has an "Open Door" Policy for anyone (from any district) who wishes to discuss legislation in our State House. I have never known him to turn down any request. His voting record is impeccable. In fact, I don't know anyone who would have a bad word to say about him. Right now he is facing a challenger for his seat. Delegate Kump, the independent voice of the people, is a Constitutionalist at heart, and he refuses to bow down to the establishment of any poltical party, although he is willing to make compromising choices if that is what is best for good government. There are those who fear this independent "Voice of the People". Delegate Kump was first elected to the West Virginia Legislature in 2010. He currently serves on the House of Delegates' Constitutional Revision, Government Organization, and Pensions & Retirement Committees. He also serves on the Legislature's Select Committee on Minority Issues. He has over forty years of prior legislative and public administration skills and experience. He serves to benefit the people and not his own self-interest or the status quo. Without Delegate Kump at the helm of his district, we all would suffer greatly , and justice would not be served. Let's continue to support the "True and Honest" voice of the people. Just another concerned Mountaineer citizen. Also check out my other entry here on my website on this issue ("I-81 Highway News"). The Quad-State Conference of State Legislators from neighboring portions of Maryland, Pennsylvania, Virginia, and West Virginia met on Wednesday, September 11th for their annual brainstorming session at the Parlor House restaurant in Waynesboro, Pennsylvania. Among multiple issues discussed of parallel problems and proposed solutions at the state legislative level, there was major discussion and an action item approved regarding the traffic bottlenecks and public safety problems on Interstate 81. The conference unanimously endorsed a resolution for the state legislators to jointly petition federal legislators and leadership on behalf of prioritizing federal funding to make improvements in I-81. Pennsylvania State Senator Richard Alloway was chosen to coordinate these multi-state state legislator efforts. This Quad State meeting was not conducted at taxpayer expense. Footnote: Unlike state and county roads, our national Interstate highways are fedrally funded and subject to federal regulation. The Presidential election was heating up, and some grade school children were showing an interest. The teacher decided that having an election for a class president would be a good civics lesson. The students would choose the nominees. The nominees would make campaign speeches, and the class then would vote. There were many nominations. Sam and Sadie were picked as finalists. Both were good kids. The day arrived for them to make their speeches. Sam went first. He had specific ideas about how to make the class a better place, and promised to do his very best. Everyone applauded. Then Sadie spoke. He said, "If you will vote for me, I will give everybody ice cream." The class went wild, screaming, "Yes! Yes! We want ice cream!". Sam didn't say anything more. He didn't have to. A discussion followed. How did she plan to pay for the ice cream? Sadie didn't know. Would her parents buy it, or would the class pay for it? Sadie didn't know. The class really didn't care. They just wanted ice cream. Sadie won by a landslide. Sometimes, elections are like that. So, when we vote, let's do so on the basis of positive principles and not on puffed-up promises and platitudes.